Outdoor post lighting can be a beautiful and functional path lighting solution, but leaving them on all night creates a lot of light pollution that can irritate the neighbors and uses a lot of electricity. 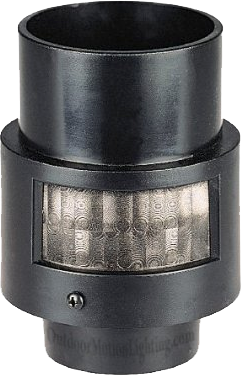 This Heath/Zenith post light motion sensor fits on standard 3″ light posts and converts them into motion lights. This lamp post light sensor is built of solid brass, and like most of their products, is built to last. The motion sensor is inset and unobtrusive. I like the Heath/Zenith feature set. Most of their lights have these features, and they tend to be one of the best values in the industry. You can set the light to provide accent lighting during the evening. It will immediately brighten to full when it detects motion. the accent lighting turns on at dusk and stays on (if you want it to) 3 hours, 6 hours, or dusk till dawn. Once the light is triggered it can be set to stay on for 1, 5, or 10 minutes. The switches for controlling these settings are on the bottom of the unit. Installation post light sensors is easy enough. Just add the unit as an extension between post and light. The lamp post light sensor has three wires to twist to the existing wires in the post and the light, and three clamp screws to tighten it down. A few quirks that may confuse you in the settings: Dawn, power outage, or leaving the switch off for a minute and turning it back on will return the light to AUTO mode if you have it set on manual. Switching between AUTO and Manual modes is done by turning off the light switch for one second and then turning it back on.